Lee Unkrich and Adrian Molina co-direct this animated adventure-comedy written by the directors and Jason Katz and Matthew Aldrich, about Miguel (voiced by Anthony Gonzalez), an aspiring musician from a family in which music is banned. Miguel is swept into the Land of the Dead meets his forebears, in this film that explores the Mexican tradition of el Día de los Muertos, or the Day of the Dead. The Disaster Artist is the story of an earnest, quirky dreamer—a real oddball but also a free spirit. It's about testing the limits of this dreamer's philosophy and can-do spirit. It's also about the limits of friendship, commitment to one's art, and the danger of mixing dreams with unlimited funding. Greg Sestero is a 19-year-old pretty boy who wants to become an actor. Tommy Wiseau is a charismatic weirdo who's long on confidence but short on talent. He's a mystery to Greg, who wishes he had Tommy's fierce belief in himself. The first third of the film develops their burgeoning friendship as they attempt to get a foothold in Hollywood. Tommy may be confident on the outside, but he's also emotionally needy, and he becomes possessive of Greg. When it becomes clear that Hollywood isn't interested in Tommy and only mildly interested in Greg, they hatch their plan to make their own movie, mysteriously financed by Tommy himself. The Disaster Artist accentuates the mystery behind Tommy, who claims to be Greg's age (though he's clearly much older) and whose Eastern European accent he claims comes from his New Orleans upbringing. Tommy is a liar and deeply protective of his lies, telling Greg he's not allowed to talk about him to anyone. It's all very strange, and though you might think watching a film about the making of a terrible film would also be terrible, it's in fact awesome! Tommy is deeply interesting, and though he's a talentless actor, director, writer, and producer, he committed to his "art." That's admirable. According to IMDB, Wiseau was born on Oct. 3, 1955, in Poznan Poland, but who knows? Rumors said the money came from organized crime. All I know is that he and Sestero (born July 15, 1978, in Walnut Creek) are still friends and still act together. Sestero wrote a film that he and Wiseau starred in called Best F(r)iends, about a homeless man who befriends a mortician, and they go into business together, leading to paranoia. There's also a sequel. These guys are both committed dreamers, making it happen! Aside from the humor, what I most enjoyed about The Disaster Artist was watching Tommy and Greg's friendship evolve, devolve, and evolve again. The Franco brothers do a great job slipping into these two characters, James especially, adopting Wiseau's affectations without it feeling like mere mimicry. At the end of the film, after the credits begin, scenes from The Room and those same scene recreations from The Disaster Artist are played on split screen, so you can see them simultaneously. Wow. Just, wow! It's hard to believe The Room exists and still has a life out there. DADDY ISSUES In Father Figures, two brothers (Owen Wilson and Ed Helms) set out to find their real dad. HARMONY In Pitch Perfect 3, the Bellas are back to sing together for an overseas USO tour. 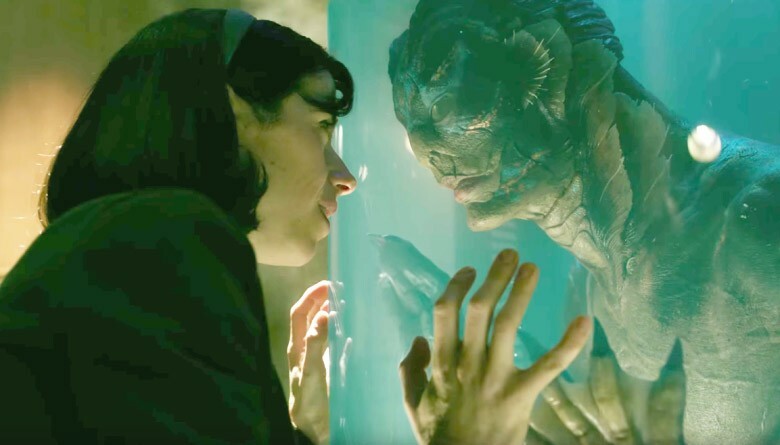 LIFE Government worker Elisa (Sally Hawkins) develops a strong connection with the subject of an experiment in The Shape of Water. Three Billboards Outside Ebbing, Missouri is one shape-shifter of a movie. Is it a comedy, tragedy, or quest for vengeance, redemption, and catharsis? Director/writer Martin McDonagh (The Guard) manages to convince you it's all of the above at different twists and turns in the story. It's a move that instantly sets the town aflutter, leading the viewer down several storylines. There's police chief Bill Willoughby (Woody Harrelson, The Glass Castle, Nanking), who feels targeted by the billboards while he's simultaneously dealing with life-threatening cancer. And we can't forget Willoughby's ne'er-do-well deputy Jason Dixon (Sam Rockwell, Frost/Nixon, In The Soup), who has a history of allegedly torturing black people but somehow still has the trust of his boss. And there's the squirmy ad salesman Red (Caleb Landry Jones, Get Out, The Social Network), who surprisingly shows enough gumption to put the billboards up even though he gets flak being (we think) one of the few gay people in town. Meanwhile, the doe-eyed used car salesman James (Peter Dinklage, Game of Thrones) makes not so subtle passes at Mildred after she gives an interview on TV. At home, not everyone is on board with Mildred's bold move. Her teen son, Robbie (Lucas Hedges, Manchester By The Sea), is thrown further into depression by the memories the billboards drag up of his sister. And things get downright violent between Mildred and her abusive ex-husband, Charlie (John Hawkes, Lincoln).